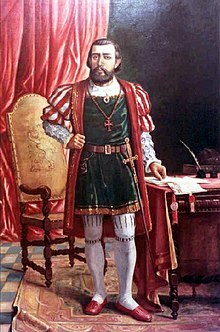 Martim Afonso de Sousa (c. 1500 – 21 July 1564) was a Portuguese fidalgo, explorer and colonial administrator. Born in Vila Viçosa, he was commander of the first official Portuguese expedition into mainland of the colony of Brazil. Threatened by the presence of French ships along the coast of Brazil, the Portuguese crown in December 1530 sent a fleet with 400 people led by Martim Afonso de Sousa to establish control and explore. His mission was to place Portuguese markers as far south as the River Plate estuary, but he was shipwrecked there. Upon return to São Vicente and Santos, in 1532 he led troops guided by the native inhabitants and by earlier Portuguese settlers such as João Ramalho up the Serra do Mar mountains to the area near the future village of São Paulo. On the high plateau, he founded the town of Santo André. He also established a sugar mill near the coast at São Vicente, with sugarcane brought from the Portuguese Cape Verde islands. In both activities, Afonso de Sousa established a pattern followed by Portuguese colonizers and Brazilians for long afterward: the "entradas" and "bandeiras" – or explorations and raids into the interior – and the production of sugar along the coast for export. Sousa was the first Royal Governor of Brazil. He settled in the north-east region of the modern country. Afonso de Sousa also acquired Diu, in India for Portugal in 1535. From 1542 to 1545 he was governor of Portuguese India. He died in Lisbon in 1564. ^ a b c "Martim Afonso de Sousa | Portuguese admiral". Encyclopedia Britannica. Retrieved 14 January 2017. ^ de., Toledo, Roberto Pompeu (2003). A capital da solidão : uma história de São Paulo das origens a 1900. Rio de Janeiro: Objetiva. ISBN 8573025689. OCLC 55114941. Pedro Taques de Almeida Paes Leme História da Capitania de São Paulo "History of the Captaincy of São Paulo"